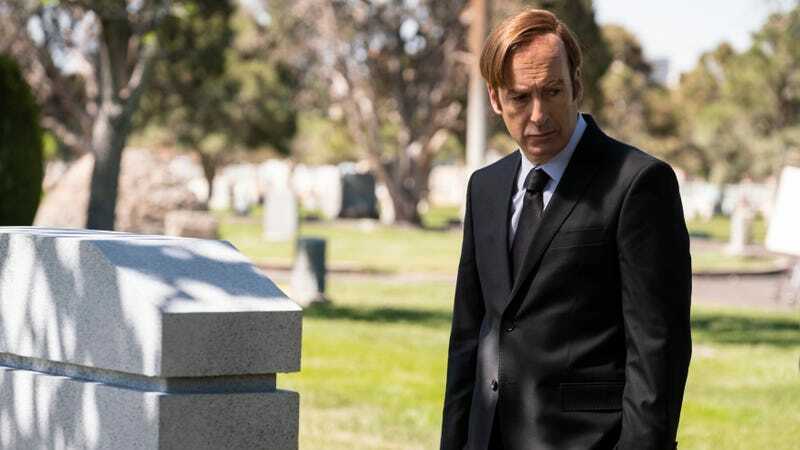 Bad news for fans of Albequerque legal dramas, or the ins-and-outs of the Nebraska Cinnabon game: Neither Saul Goodman, nor Jimmy McGill (or Gene, for that matter) will be coming back to TV in 2019. This is per a new Vulture interview with AMC Networks president Sarah Barnett—centered largely on the success of BBC America’s Killing Eve—that also briefly confirmed Better Call Saul will return to TV in 2020. That’s obviously a bummer, but it’s also not wholly unpredictable; while the Bob Odenkirk-starring series maintained a February-through-April schedule for its first two seasons on the air, it’s been consistently slipping a few extra months ever since, debuting its third and fourth outings in April 2017 and August 2018, respectively. Barnett was careful to note that the decision to delay the show until next year was “driven by talent needs,” and refused to give any hint about how much longer the critically acclaimed Vince Gilligan series might continue at AMC.